JANE: Last week you said that you’d had another thought about aliens and how we react to them. I’ve been waiting all week to find out what this is! ALAN: Yes, I did say that, didn’t I? Well, once you recognise that alien intelligences exist, a whole new set of problems arise. Probably the most important is the question of how you do you communicate with them? In other words, how do you handle the “first contact” problem? JANE: Oh! I love first contact stories. I’ve even written a few… But you first! ALAN: It’s easy to see an analogy with the classical age of exploration here on Earth. The European explorers came across many strange societies and faced this problem in real life many times. A brilliant novel that explores this is James Clavell’s Shogun which sees Japanese culture from a European point of view. The two societies are so utterly different from each other that the novel can easily be read as a dramatisation of the science fictional first contact. Several reviewers and critics have remarked on the parallel – I’m by no means alone in suggesting it. JANE: Shogun is great. “Maybe a duck…” Talk about culture clashes! When I set out to write the first Firekeeper novel, Through Wolf’s Eyes, I realized that in many ways that the Mowgli stories in The Jungle Books and Tarzan are both “first contact” stories because, although human by birth and biology, both Mowgli and Tarzan begin their association with humanity from an alien mindset. Mowgli thinks of himself as a wolf first and a “citizen” of the larger community called “The Jungle” second. He clearly adheres to the “social contract” that is itemized in the Laws of the Jungle. Anyhow, my awareness of this shaped Through Wolf’s Eyes and the sequels, because I didn’t want to do another “first contact,” story – or rather “only” a first contact story. ALAN: I never thought of those as “first contact” stories before, but now that you’ve pointed it out, I think you’re right – that’s exactly what they are. But, in pure science fiction terms, I think that Murray Leinster’s delightful novellette “First Contact” is probably the archetype. It comes up with a really ingenious answer to the problem. JANE: If I read that, it was so long ago that I’ve forgotten it. Can you tell more or would that completely ruin the story? My second published novel, Marks of Our Brothers, is an alien first contact story. However, unlike many such stories where a meeting in space or suchlike makes very clear that the aliens in question must be “people” not “animals,” (after all, they have spaceships or space stations or something), the problem in Marks of Our Brothers is somewhat different. Here the question is whether or not the aliens in question are “people” at all. They don’t have hands. They are not obvious tool users, even on the primitive level of, for example, David Weber’s treecats. In fact, they look rather like Labrador retrievers. The book grew out of my fascination with how many tests sociologists and suchlike use to measure “intelligence” are based on human norms. ALAN: Of course, the stories we’ve both mentioned assume that the humans and the aliens do actually have a communication channel, either face to face or through some sort of communication device. The problem becomes much harder to solve if the alien race is long dead. JANE: Yeah, “long dead” would make it difficult to have any sort of contact with a race. ALAN: That’s true in a very literal sense. (Sorry to ruin your joke by taking it seriously.) But it does raise the question of just how could archeologists of the future come to grips with the language and culture of a society that has no living members with whom to talk? There are lots of societies here on Earth that we know very little about, and whose written records we cannot read. How much harder will that be for truly alien societies with which we have nothing in common? JANE: Since I’m married to an archeologist, I’ve seen firsthand how difficult it is to learn about a past culture – even if that culture has living descendants. The complexities would grow exponentially with a completely alien culture. ALAN: H. Beam Piper came up with a beautiful solution to the problem in his short story “Omnilingual.” He assumes that technological societies have more in common with each other than non-technological societies do because scientific truths are universal. The story itself uses the periodic table of the elements as a Rosetta stone to unlock the secrets that an alien society had left behind. JANE: Okay. I’m sure I read that one, but it’s been a while… I need to find a copy and re-read it. Any other good first contact stories to suggest? ALAN: I’m very fond of a series of short stories about a team of unorthodox engineers by the British writer Colin Kapp. In each story, the team is presented with an alien technology from a long dead race. They have to deduce what the technology is for, often to a tight deadline. After several semi-catastrophic red-herrings lead them up several garden paths, they eventually find out what the technology is really supposed to do, just in time to prevent a disaster. An alien first contact short story I’m fond of is Larry Niven’s “The Warriors.” It’s the tale of the first encounter between humans and the Kzinti. You get a look from both sides and the each makes assumptions based on their own cultural values that are fascinating. JANE: Another place to sample a bunch of first contact stories is the anthology First Contact edited by Larry Segriff and Martin H. Greenberg. I contributed a short story called “Small Heroes,” which is reprinted in my new collection Curiosities. ALAN: I’ve not read that one either. Oh well – at least I’ll get to read your story when I buy my copy of Curiosities. This entry was posted on October 8, 2015 at 1:00 am and is filed under Thursday Tangents. You can follow any responses to this entry through the RSS 2.0 feed. You can leave a response, or trackback from your own site. Actually, there’s a real-life version of this (American tax dollars at work). Check out NASA’s free e-book Archaeology, Anthropology, and Interstellar Communication, edited by Douglas Vakoch. NASA’s occasionally invited in anthropologists like Ben Finney (an expert on Polynesia) to talk about how the way people have settled in alien environments (like Pacific atolls) can give us insight into how humans might colonize space, and if you google “Ben Finney NASA” you can find the material, some of which dates back to the 1970s. ‘First Contact’ is probably most easily found in Silverberg’s Science Fiction Hall of Fame, vol 1, which was last reprinted a decade ago and shows in print at Chapters. I need to excavate my copy – I just realised that, despite reading it multiple times, I’m not sure I’m thinking of the right story. ‘Omnilingual’ was included in The World Turned Upside Down, a collection that Jim Baen, David Drake and Eric Flint slapped together a while back [I’ll let them explain the title. Surely Toni or Ursus would comp you a copy]. Omnilingual was the first title that popped into my head when I saw the topic of the day. Thinking about it, while Piper is essentially correct in his premise, taking the work past the end of the story is going to be even more brutal than he suggested – and he didn’t minimise the difficulties his linguists were facing. The _way_ science is presented in print depends a lot on convention, and many of them are somewhat arbitrary. While the results may be universal, the route you take to get there needn’t be, and that’s actually what gets into the documents. Alan and I have resolved that the Tangents will be as much like “real” chats as we can make them, not research papers. This means we have the pleasure of not trying to sound like “know it alls” and instead get to enjoy wonderful additional information! P.S. 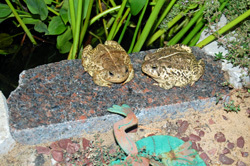 The featured toads are perched at the edge of the tiny pond in my backyard. They patiently waited while Jim fetched his camera and I spotlighted them with a flashlight. Oh, dear. I’d better go out tonight and clarify! Hi Jane it’s Jasmine Olson again I come in peace. Aliens or foreign people mainly they’re same thing, the two words are just thought of in a different way especially by kids. Even when you read PEGUSAS books the Greek mention like about 6 places in the Heavens especially in the books that mention where the Olympian people originally came from first Ma’am. Actions and appearance think of an alien in any way you’d like Jane. The lemurs in the Madagascar movies have to find out Alex the lion and his 3 New York Zoo friends aren’t aliens, that they’re just 4 animals who don’t know their real homelands yet. The attitude of a single alien or a group of them it’s all up to you. I’ll tell you dear Jane LINDSKOLD I’ve studied pretend wolves enough that even the word werewolf doesn’t scare me and I’ve also done numerous enjoyable wolf quizzes too. I have an easy enough time trying to see through a wolf fiction/ real that I Jasmine Olson in UT. feel like the wolf is my totem. Maugrim in Narnia, Sebastian in Zookeeper, Odessa and her mate Darius in the series called THE LAND OF ELYON, Akela and his brother Rama who protect Mowgli in the Jungle Book, Lupus in the sky, FAOLAN in another enjoyable wolf series called THE WOLVES OF THE BEYOND, these are a few of the fiction wolves if you ever decide/ desire to write any similar story of your own just using these as hints of your new characters. I love wolves so much that they’re the animal I study the most non- fiction and fiction Jane this is Jasmine Olson expressing her level of sincere admiration. PRINCESS WHO FEELS LIKE SHE CAN SEE THROUGH THE WOLVES, COWGIRL WHO WATCHES THE WOLF PACKS FROM A SAFE DISTANCE BUT ALSO ALLOWS THE CLOSEST WOLF PACKS TO SOMETIMES AID HER WITH HARD TASKS LIKE DIGGING WHILE YOU’RE ACTUALLY MINING MINERALS OR SOME SPECIAL ROCKS, AN WESTERN ADVENTURER WHO’D GO TO THE WOLVES’ SANCTUARIES DOUBTLESSLY, A NATURE LOVER WHO’D RESCUE THE WOLVES HERSELF IF SHE HAD THE MONEY ONLY THAT HER DISABILITIES BLOCK HER CHANCE, A GOOD WITCH WHO LOVED THE WOLVES AND SAVED THEM FROM TROUBLE, OR A BRAVE FERAL GIRL WHO WANDERED BUT HAD THE WOLVES AS HER BFF GROUP, THIS IS JASMINE OLSON AGAIN THESE ARE HER EXAMPLES OF WHAT KIND OF FEMALE SHE DREAMS OF BEING IN STORIES IF YOU EVER WROTE A FUN FICTION STORY OF ONE OF YOUR TRUE BOOK FANS JANE. THE MAIN THING IS BEING DISABLED I KNOW I WOULDN’T BE PAID BUT BEING AN AUTHOR WRITING WOLF STORIES IS ONE OF THE SORT OF IMPOSSIBLE TASKS I GET KIND OF DREAMY ABOUT JANE, AND THE WOLVES ARE MY NUMBER ONE FAVORITE OF ALL WILD ANIMALS. HENRIETTA ABEYTA’S GRANDDAUGHTER JASMINE OLSON WHO’LL SURE CONTINUE TO READ YOUR BOOKS JANE LINDSKOLD.